Invest in automatic greenhouse vents and you will always have the right temperature for your plants. 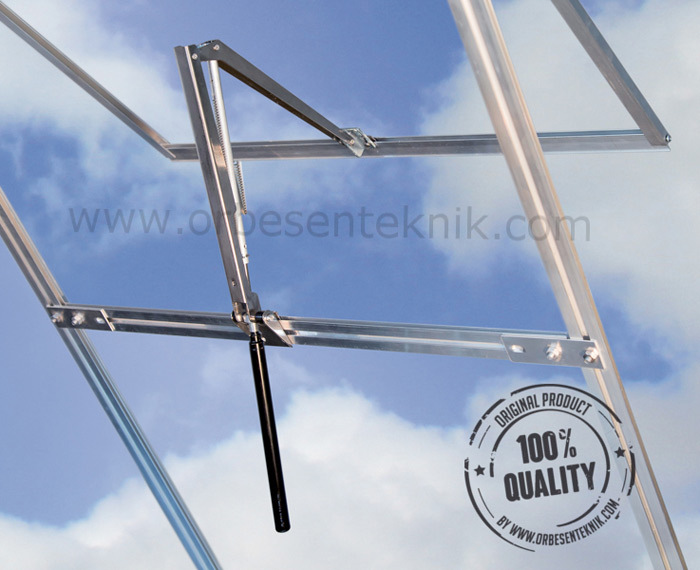 J. Orbesen Teknik ApS offers the markets best automatic greenhouse vents. We have manufactured automatic greenhouse vents for more than 30 years. Today we are proud to have conquered the position as the world’s leading manufacturer of automatic greenhouse vents. In our huge selection of automatic greenhouse vents you will be able to find your next automatic greenhouse vents. Below you will find some information on our innovative automatic greenhouse vents. Please allow yourself to take a tour on our website. Here you will find more information on our great automatic greenhouse solutions. On the website you will find high quality pictures of all our products. Give us a call if you have any unanswered questions about our automatic greenhouse vents or automatic greenhouse solutions in general. The quality of the Sesam Spiro automatic greenhouse window opener is emphasized with the fact that it is manufactured in stainless steel. Furthermore it uses our well-proven standard hydraulic cylinder. One of the unique features of the Sesam Spiro automatic greenhouse window opener is that it keeps the hydraulic cylinder inside the greenhouse no matter if the window is open or closed. The automatic greenhouse window opener reacts on the inside temperature in the greenhouse and not the outside temperature. The Sesam Spiro is designed with a long opening stroke. The large opening of the vent is necessary for a good and natural ventilation of the greenhouse. The core technology in our automatic greenhouse window openers is the hydraulic cylinder that contains a plant-based wax. The special designed cylinder containing this wax, works as the thermostat of the window opener, leaving no need for an electrical power supply. Contact us today if you need more information on our automatic greenhouse vents. We can guide you and help you choose the perfect solution for your greenhouse.